Maxine Arnold Gooding, 91, of Flemingsburg, passed away Wednesday, May 23, 2018, at Fleming County Hospital. Maxine was born in Beechburg, Kentucky, on November 3, 1926, to the late Clarence and Desma Parker Arnold. 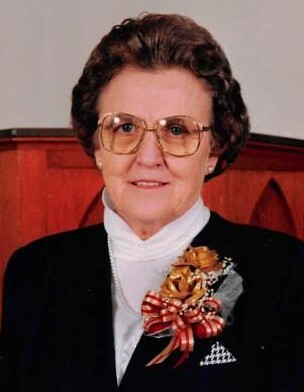 Maxine was a homemaker who devoted her life to her family and farm. She was a member of the Mount Carmel Methodist Church. She was preceded in death by her husband, Jesse Gooding; her parents; and her great granddaughter, Elizabeth Hay. She is survived by her children, Johnie (Kathy) Gooding of Mt. Sterling, Kenny (Linda) Gooding of Flemingsburg, Sharon (Don) Young of Flemingsburg, Patty (Rick) Brock of Nicholasville; her grandchildren: Melissa Williamson, Dennis Jolley, Dawn Bilbrey, Holly Hilterbrand, Kim Hash, Amber Flowers, & Jonathan Gooding; her six great grandchildren; her three great, great grandchildren; and several nieces and nephews. She is also survived by her special dog, Itsy. Funeral services will be at 3 p.m., Sunday, May 27th, at Boone-Nickell Funeral Home with Rev. Paul Cropper officiating. Maxine will be laid to rest next to her husband in the Fleming County Cemetery. Visitation will be 1 to 3 p.m., also on Sunday, at the funeral home. Pallbearers include Scott Hilterbrand, Zach Hilterbrand, Brandon Flowers, Jonathan Gooding, Brandon Williamson, Mike Bilbrey, Todd Hash, and Tommy Hay. Honorary pallbearers include Dennis Jolley, Bob Goodman, Don Lee, L. D. Doyle, Jr. Doyle, and Larry Doyle. In lieu of flowers, memorial contributions may be made to Hospice Of Hope (909 Kenton Station Drive, Maysville, KY 41056) and/or the Activity Fund at Pioneer Trace Nursing Home (115 Pioneer Trace, Flemingsburg, KY 41041).